In the words of Chris Lay, Marsh UK and Ireland’s CEO, “we need more rigour in identifying the major sources of value destruction.” This year’s report is a key tool for this. 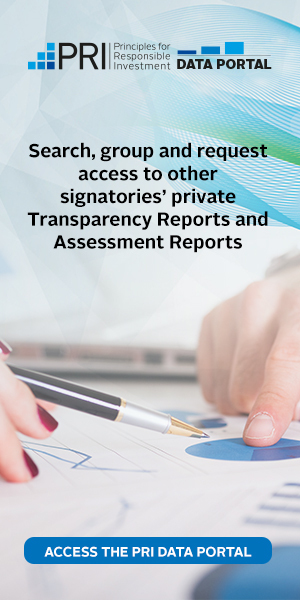 What are the key takeaways for PRI signatories? Environmental risks dominate the global risks landscape in terms of impact and likelihood for the third year in a row. This includes extreme weather events and failure of climate mitigation and adaptation. Alarm bells should be ringing; we have only 12 years to stay beneath 1.5C. However, there is a lack of political will to set more stretching targets to cut emissions. The report finds that business leaders are more concerned about climate in the long term. This disconnect will need to be tackled. Power is moving towards more nationalist, authoritarian states and they are becoming more inwards-looking. With greater geopolitical friction, our ability to cooperate to solve challenges such as cyber risks and climate change has become more challenging. Geopolitics and geoeconomic factors, such as uncertainty and nationalism are fuelling risks. Innovation is also outpacing our ability to manage it and there are growing concerns around technology misuse. Respondents also see a more precarious economic situation in 2019. What do the risk community and business leaders see as top shorter-term risks? Shorter-term fears are around geopolitical and cyber threats. Ninety-one percent of respondents to the report expect major power-economic tensions. Eighty-eight percent expect erosion of trade relations and 82% expect cyber attacks. For top business leaders, cyber risk concern is rising globally and is the highest ranked threat. Other concerns also exist including fiscal crises, unemployment, energy price shocks, national governance failure, interstate conflict and natural disasters. There is a significant financing gap (US$18 trillion) in infrastructure capital – with only US$79 trillion currently planned between now and 2040. This means 20% more financing is needed than we are putting in today. Furthermore, infrastructure needs to be resilient to extreme weather events. Business, with its reliance on public sector infrastructure, will be impacted and need to work with government on solutions. What’s different to last year’s report? There are several shock scenarios in this year’s report: factors considered include pressures of expanding urbanisation and implications of new technologies. Companies are encouraged to invest in building response scenarios, such as a crises preparedness playbook, broad-based resilience and strategic adaptation. Companies that adapt faster and build in agility to future changes will have competitive advantage over rivals. Increased impact of extreme weather events is expected, with an accelerated pace of biodiversity loss, disruptions to the production and delivery of goods and services (an increase of 29% in disruption over the last six years), as well as upheavals in the global waste disposal and recycling supply chain. We face growing vulnerability to rising sea levels. Seventy percent of the largest cities in Europe have areas at risk. Groundwater extractions and urban sprawl means some cities are sinking faster than sea levels are rising. There is an urgent need for cities to become more resilient. Infrastructure is at risk; roads, railways and ports. It is estimated that a 0.5-meter rise in sea level would bring 84 days of rail disruption in the UK. Globally, 270 power plants are at risk. How could investors take action in light of these findings? Risk is about peripheral vision, rather than looking straight ahead. Managing global risks must involve encouraging scepticism and challenging our preconceptions through use of tools. Companies need to act now by understanding business and strategic risks, and to mitigate and adapt to climate change. Infrastructure must be built to adapt to a changing climate. Future shocks need to be taken seriously: scenarios are “plausible fiction” not just “science fiction. Risk managers need to think holistically about risks and how they interrelate.